MADACC picked up an emaciated female brindle pit bull type dog from Glendale Police Department. She is estimated to be 5 years old, has been bred more than once and has some mammary tumors, and weighs in at only 32lbs. That is about half of what her healthy weight should be. She also has been preliminarily diagnosed with entropian in both eyes (eyelids that are turned inward against the eyes which are quite painful). 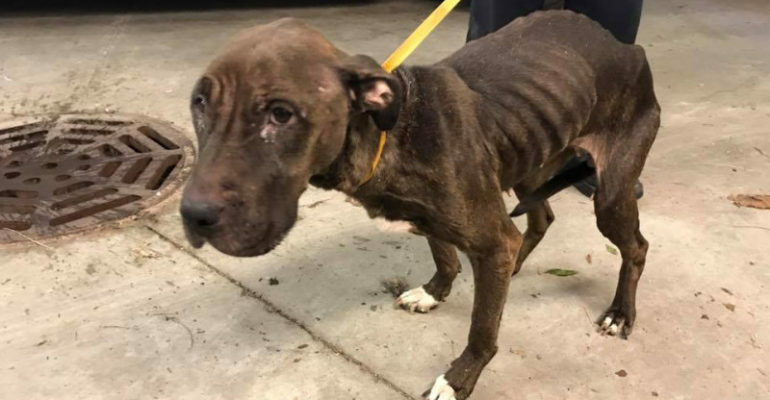 The Glendale PD posted this dog on their website, and MADACC received some phone calls from news stations about this dog, so they asked us to post this update for them. Sadly, at MADACC a dog in this condition is not newsworthy. They see dogs in this condition, and worse, every single day. Her road to recovery will be long, but they are providing appropriate medical care and feeding to ensure she heals at the right pace. MADACC will need funds to cover her eye surgeries and tumor removal so if you would like to help this sweet girl make progress to a new life, please consider donating at the top of this page. We can only make assumptions as to what led to her being in this condition, and we have no way to track her to any owner. MADACC focuses on the animals and does not spend energy on the past. They focus on the future for this girl. We heard a Glendale police officer is insterested in adopting her so hopefully she will have a happy ending in the future. If you can donate, we would appreciate it. All Friends of MADACC funds go to helping animals and all donations for this girl will go directly to her. MADACC plans to call her Ruthie for now. Update: You can also donate to Ruthie through a GoFundMe page organized by the Glendale Police Department.